Valentine’s Day is one of those fun holidays. It’s the kind where you are not obligated to travel far and wide to visit family or commit to major plans. It’s the kind that focuses on the love you have for your significant other and family. It’s the kind of holiday where eating copious amounts of chocolate is not only allowed, but encouraged. This year, ditch those restaurant reservations in favor of cooking up the perfect Valentine’s Day dinner at home with your spouse! Valentine’s Day might hit us right in the feels, but it can also hit us right in the wallet. 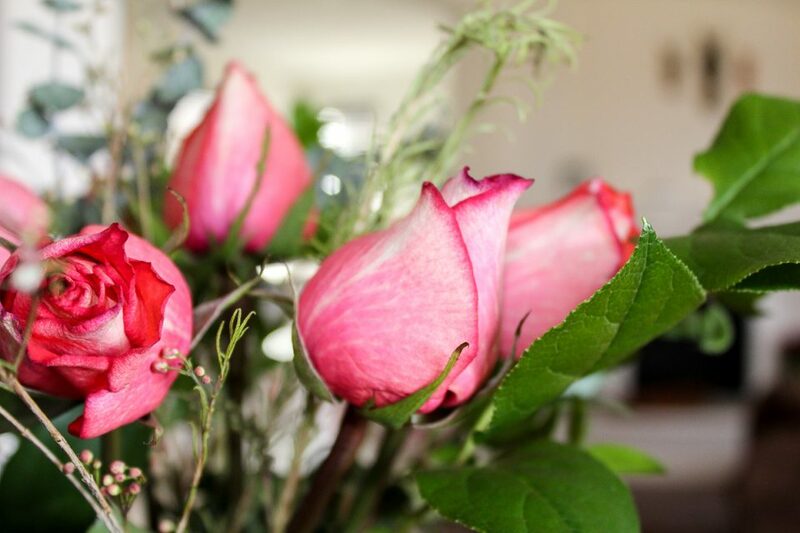 Have you seen the price for a bouquet of long-stem roses? Flowers, candy, sappy cards, wine, and diamonds (see how we slid that in there) are all primed to make an appearance. There also may be a nice, romantic Valentine’s Day dinner. If you have kids, this typically also involves hiring a babysitter unless you’re lucky enough to be stationed near family. When all is said and done, you’re out a few hundred dollars and can’t even drink more than a glass or two of wine because you have to drive home after dinner! You thinking what we’re thinking — Why go big when you can stay home? Now don’t get us wrong, we love to get out of our work out gear and top knot routine and throw on something fancy (read: anything that’s not leggings). But, there is something to be said for creating your own date night at home. Not only do you get to be comfy and sip on some wine while you cook, but you’ll save some serious coin by making an award-worthy dish in your own kitchen! So, let’s get to the actual Valentine’s Day dinner recipe! This meal brings together the best of surf and turf. You have tender filet mignon topped with a tangy red wine and balsamic vinegar reduction. There are also jumbo lump crab cakes (yes, you can master these at home), served with a Sriracha lemon aioli. Roasted asparagus and garlic smashed potatoes round out the plate of yumminess and ensure you get your fair serving of veggies. If that wasn’t enough, there are the cutest individual chocolate molten lava cakes for dessert! We highly recommend serving these up with a big scoop of vanilla ice cream on top because, hey, you’ll earn it after cooking up this meal! We have simplified the steps, so this recipe is easy to follow, even for cooking novices. Get the kids involved in making Valentine’s Day dinner; they’ll love making the dessert! Or, pull your honey into the kitchen and crack open a bottle of wine while cooking together. 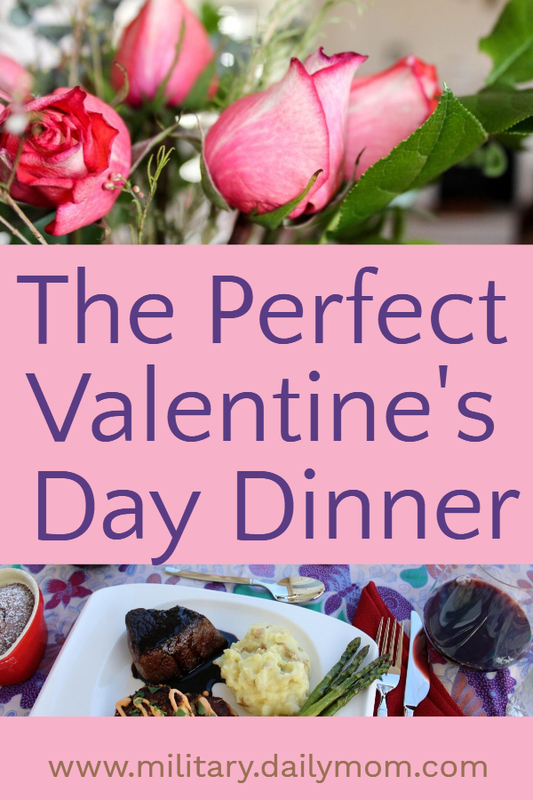 If you are looking for a special treat, pass this recipe on to your spouse and have them cook the perfect Valentine’s Day dinner for you. Or, maybe you want to cook solo and kick your feet up while your valentine does the dishes. 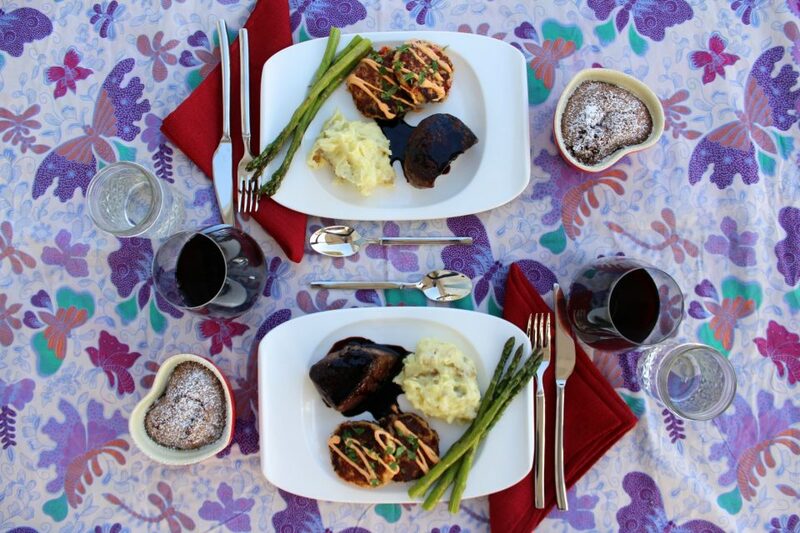 Maybe you’re in the middle of the deployment that just won’t end, and you spin this Valentine’s Day dinner into Galentine’s Day dinner. We’re just saying you’ve got some options, valentine. 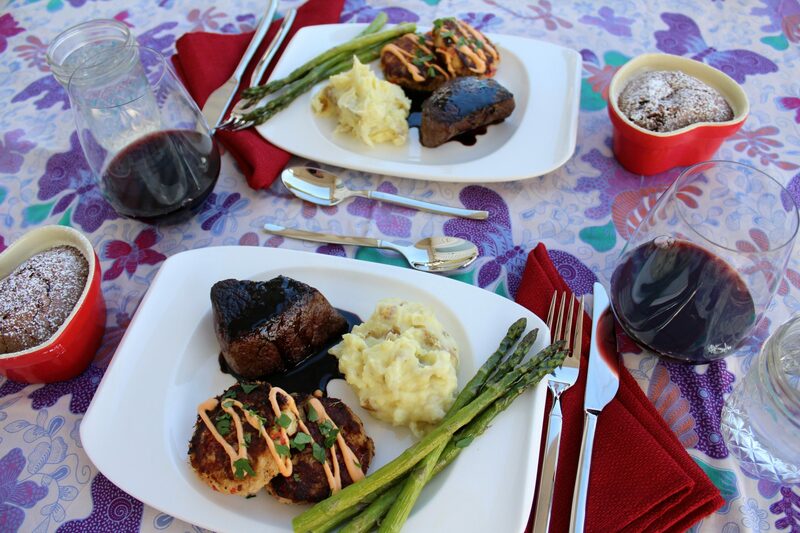 Serve the perfect V-Day dinner at home: filet mignon with a red wine balsamic reduction, crab cakes with lemon aioli, garlic smashed potatoes, and roasted asparagus! In a small pot over medium heat, add the balsamic, red wine, and sugar. Bring the mixture to a low boil, then reduce the heat to medium-low and let simmer for 25 minutes. The sauce will be reduced by half and will start to thicken slightly. Remove from the heat and allow to stand for a few minutes, as it will continue to thicken a bit off of the heat. Set aside until ready to serve. Meanwhile, scrub the potatoes clean, then cut into 1-1 1/2-inch chunks (keep the skin on). Add the potatoes to a large pot filled with salted water and bring to a boil. Once boiling, cook the potatoes for 15-20 minutes, or until a knife inserted into the center comes out easily. Drain the potatoes, then place them back into the pot off of the heat. Add 1/4 cup cream, minced garlic, 1/2 teaspoon salt, and 1/4 teaspoon pepper. Using a hand mixer, smash the potatoes roughly until all of the ingredients are well combined. Add the 1/4 cup milk a bit at a time, as needed, until the desired consistency is reached. Season with additional salt and pepper, if desired. Cover and keep warm until ready to serve. Wash and pat dry the asparagus. Cut or break off the woody ends at the bottom of each stalk. Place them on a baking sheet and drizzle with 1 tablespoon olive oil, then season with salt and pepper. Set aside. While the potatoes are cooking, prepare the crab cakes. In a medium-sized bowl, stir together the crumbled crackers, minced pepper, minced onion, 1/4 cup melted butter, drained crab, Dijon mustard, lemon juice, 2 cloves minced garlic, hot sauce (if desired), 1/4 teaspoon salt, and 1/4 teaspoon pepper. Stir until well combined. Taste the mixture, adding additional salt and pepper, if desired. Add in the egg and stir to combine, then form the mixture into 4 patties. Heat 1-2 tablespoons olive oil in a skillet over medium heat. Once the oil is hot, add the crab cakes and cook for 5-7 minutes each side, or until golden brown. Be careful not to move the crab cakes too much while cooking, as they are delicate and can break apart easily before the crust forms. Meanwhile, remove the beef from the packaging and pat dry with paper towels. Using a fork, spread the softened butter on both sides of each fillet, then season very generously with salt and pepper. Add 1 tablespoon olive oil to an oven-safe sauté pan (cast iron works great) and place on medium-high heat. Once the oil is very hot, add the beef. Sear on each side for 3-4 minutes to create a nice crust, then place the pan into the oven and roast for 6 minutes (for medium rare). Keep the steaks in the oven for a few mins longer if you prefer steak more well done. Remove the pan from the oven and allow the steaks to rest for 5 minutes before drizzling with the red wine balsamic sauce. While the steak is searing, place the asparagus into the oven. Roast for 10-12 mins, flipping them halfway through cooking. In a small bowl, whisk together the mayo, sriracha, and 1 teaspoon lemon juice. Serve over the crab cakes. The crab cakes can be made up to one day ahead of time and wrapped in plastic wrap. Keep them in the refrigerator until ready to cook! You can also pre-make the aioli and balsamic reduction, just place into separate sealed containers in the refrigerator until ready to serve. Preheat the oven to 425 degrees. Spray 4 individual ramekins with cooking spray. Stir together the melted butter with the bittersweet and semisweet chocolate in a large bowl until all of the chocolate is melted. If it is taking too long to melt, you can microwave the mixture in 10-15 second increments. Whisk in the powdered sugar until well combined, then whisk in the eggs, egg yolks, and vanilla. Whisk in the flour, then pour the mixture evenly into the four ramekins. Bake the lava cakes for 15-17 minutes, or until the edges are firm but the centers are still soft and jiggly. Let stand for 1 minute before serving warm. *If you prefer to make these ahead of time, you can freeze them before baking and then cover well. To bake, remove the ramekins from the freezer, uncover, and bake directly from frozen for 25-27 minutes. For the sauce: Add the raspberries, sugar, and water to a small pot over medium-high heat and bring to a boil. Once boiling, reduce the heat to low and simmer for about 10 minutes. Stir in the jam, then cook for an additional 5-10 minutes. Strain through a fine mesh sieve and then drizzle over the molten lava cake. Individual ramekins can be found at kitchen supply stores like Bed, Bath, and Beyond or big box stores like Target or Walmart. Many dollar stores also sell them! These are great topped with a big scoop of vanilla ice cream right before serving! So, whether this is a trial run for an in-house Valentine’s Day dinner or your standing annual tradition because you can’t even deal with the PDA and crowded restaurant lobbies on February 14, we hope the meal, the time you share, and the money you save will make this Valentine’s Day one to remember. 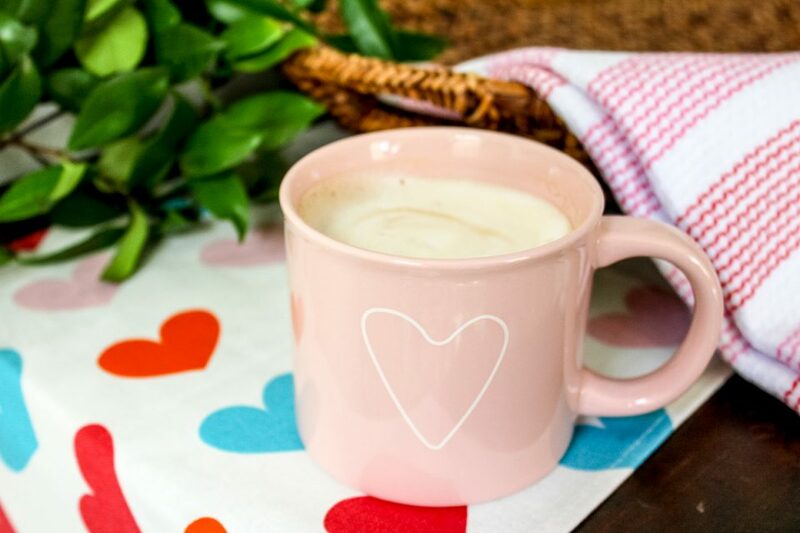 Want to create your own cocktails to go along with the Perfect Valentine’s Day dinner? Check out How To Make The Perfect Homemade Margaritas!